Introduced only late last year (and already superseded by the recently announced D5300), the 24-Mpix D5200 has a number of improvements over its mid-range predecessor, the 16-MPix D5100 model from 2011. Highlights include an improved 39-point AF module and 2016-pixel color-aware metering system, both previously found on the earlier 16-MPix D7000, plus an articulated 3-inch LCD and a new 1080/60/50i movie option. The headline feature of course was the new 24-Mpix CMOS sensor, a more or less inevitable addition following the introduction of the entry-level D3200 in 2012 using a sensor with a similar pixel count. What was a surprise was that sensor wasn’t from the same vendor (see our review here). In our tests, the sensor achieved the number one position for APS-C cameras with a DxOMark sensor score of 84 points. 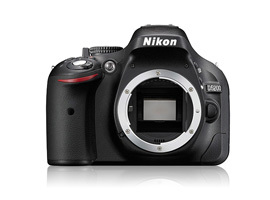 Later in the year, Nikon announced the D7100 featuring a 24-MPix CMOS sensor without anti-aliasing filter. It achieved an almost identical score. Bearing in mind its target audience, however, the sensor in D5200 retains the usual optical low pass (anti-aliasing) filter, which is used to reduce the effects of moiré – color aliasing and other unsightly artifacts. The inclusion of the filter is particularly important with video capture, where software removal is impractical, but the downside is that it also lowers high frequency (fine) detail and image sharpness. The most intriguing aspect of our lens evaluations with the D5200, of course, are the effects on image quality and sharpness of the 24-MPix CMOS sensor with the low pass filter in place, especially with regard to filter-less D7100. Our labs have analyzed the optical quality of nearly 130 models from both Nikon and third-party makers. Models range from the extreme ultra-wide DX format Sigma 8-16mm (12-24mm equivalent) f4.5-5.6 DC HSM through to the popular full-frame Sigma 50-150mm f/2.8 EX DC APO OS HSM and beyond to the, stabilized Nikon AF-S Nikkor 600mm f4G ED VR behemoth. Other new models assessed include the new full-frame Nikon AF-S Nikkor 80-400mm f4.5-5.6G ED VR as well as the recently revamped Sigma 120-300mm f2.8 DG OS HSM S telephoto zoom and highly portable Nikon AF-S Nikkor 18-35mm f/3.5-4.5G ED. Please note we’ve not yet tested the new high-speed Sigma 18-35mm f/1.8 in Nikon mount, as it was produced in Canon mount only at first, but it should be available soon and it will be added to our database in due course. 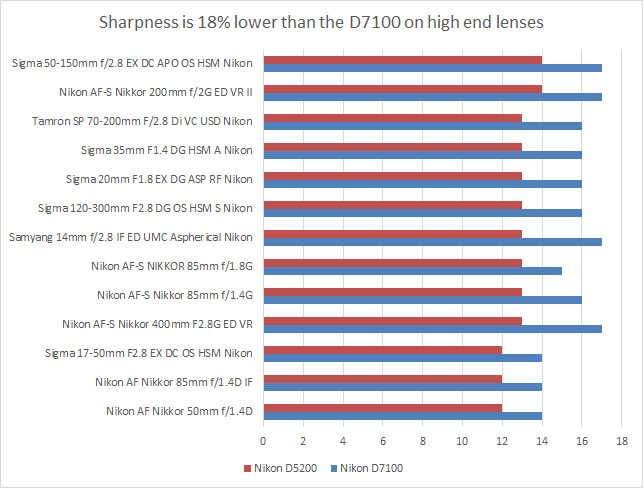 We compared sharpness data between the Nikon D5200 and the older D7000, which featured a similar Sony 16-MPix sensor with low pass filter to that of the D5100. As expected, there was a substantial increase in sharpness (expressed in our graph as P-MPix), though the amount varies from model-to-model, and depends on the design of the lens. Newer lens models are usually re-computed to achieve higher resolution, and aren’t necessarily all high-grade models, though it’s more likely that modern high-grade lenses will out-perform more modest models. On the best performing lenses in our database, the increase in sharpness was around 10% on average over the discontinued 16-MPix D7000. 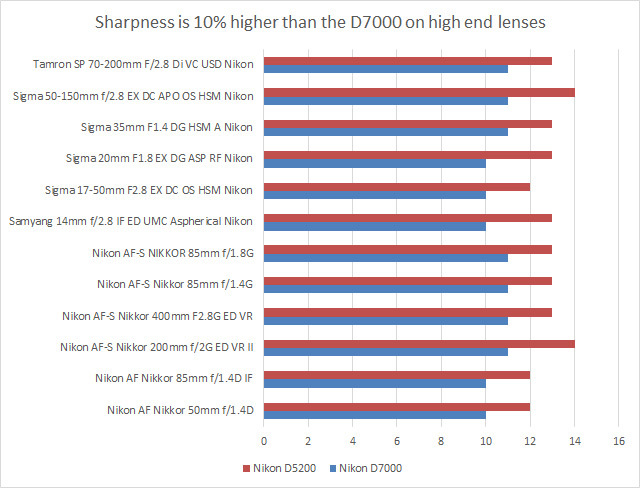 While the D5200 shows a substantial increase in sharpness levels over the D7000 with a wide-range of lenses, we also compared the same data and lenses with the D7100. The removal of the low pass filter accounts for a further increase in sharpness. And, it’s not insignificant either, averaging around an 18% increase over the D5200 with the better lenses. Little wonder the new Nikon D5300 will ship with same filter-less 24-MPix sensor as the D7100. It may come as little surprise to followers of our reports to learn that the Sigma 35mm f1.4 HSM Art series lens continues to do out-do rivals as the best performing prime lens in our database. Nikon’s current AF-S Nikkor 85mm f/1.4G is very close in overall optical quality but the Sigma is far ahead of rival full-frame offerings of the same focal length. As far as trends are concerned, the full-frame 85mm models continue to offer the highest image quality, followed by 35mm and 50mm focal lengths. It will be little surprise to learn that these models are relatively simple to design and manufacture with a high-degree of correction for image degrading aberrations. That said, there are one or two anomalies. The high-grade Zeiss 25mm f2 and the Nikon 200mm f/2G ED VR II and 400mm f2.8G ED VR models stand-out for their high image quality, as optimally corrected models. Image quality like this doesn’t usually come cheap. We revealed earlier that the 24-MPix sensor is capable of capturing higher levels of sharpness with certain lenses over the earlier 16-MPix sensor in the D5100. But, it’s also worth noting that the somewhat low-ish scores overall imply the sensor isn’t particularly efficient. As pure speculation, could this be one of the reasons why Nikon removed the low-pass filter in the D7100 and the new D5300? As a DX format camera, the smaller sensor of the D5200 restricts the field of view of full-frame wide-angle primes, limiting their full potential and making them an expensive option. Further, like most other makers, Nikon has yet to offer DX format wide and ultra-wide equivalents. But, if you already own one of these models for use with a full-frame (FX) format camera, or you intend to add an FX body in the near future, then these lenses may still be very useful. The best performing lens in our database on the D5200 was the manual focus only Zeiss 25mm f2, with a DxOMark score of 24. Somewhat surprisingly, given the shorter focal length, the sharpest was the Sigma 20mm f/1.8 EX DG. If brand loyalty isn’t an issue, as an equivalent to a 30mm the Sigma is the more useful in this category, and $629 it’s modestly priced given the bright f1.8 maximum aperture. Nikon’s AF Nikkor 20mm f2.8D model is a solid performer, given its age, but bear in mind it lacks support for AF with the D5200. Rather than produce DX format primes with short focal lengths, Nikon and rival third-party makers have concentrated their R&D budget on zoom models instead. There’s a wide choice available at modest prices, but Nikon’s full-frame AF-S Nikkor 14-24mm f2.8G ED model remains the best choice for image quality and sharpness. More practical is Tokina’s AT-X 116 (11-16mm f2.8) PRO DX model. Not only is this zoom close in IQ overall it’s wider and cheaper and as constant-aperture f2.8 model it’s just as ‘fast’. Slightly more modest in price and aspiration is the firm’s AT-X 124 (12-24mm f4). As the equivalent to an 18-35mm on a full-frame camera, at $400 its excellent value compared to the rest in the database. As an own brand lens, Nikon’s AF-S Nikkor 10-24mm (16-35mm equivalent) f/3.5-4.5G ED is a solid performer and it takes full advantage of the D5200’s lens correction features (chromatic aberration, distortion and vignetting correction) for in-camera JPEGs, and Raw files with Nikon Raw software solutions. On a full-camera the 35mm is a moderate wide-angle lens but if you’re new to digital photography it’s worth noting that the 35mm lenses have an equivalent field of view as a 50mm on a DX format body like the D5200. As we noted earlier, the Sigma 35mm f1.4 HSM A is the best performer overall with a convincing DxOMark score of 30 points, and the highest Sharpness score of 13P-Mpix. The $1,797 Nikon AF-S 35mm f1.4G, while very good, isn’t as sharp overall. And, don’t forget on a DX format body all of the full frame 35mm f1.4 lenses are big and heavy (as they project a larger image circle to cover the FX sensor). Sigma’s revamped DX format 30mm f/1.4 HSM A is a very good performer but Nikon’s DX 35mm f/1.8 is cheaper and lighter, even if it’s not quite as sharp. At $195, it’s accessibly priced and the best value overall. Traditionally lenses with 85-100mm focal lengths are ideal for portraits and sporting events but as the equivalents of 135mm models they may be just a little too long or too narrow for use indoors. Of course outdoors, it’s a different matter. The best performer optically on the D5200 is the recently revamped high-end AF-S Nikkor 85mm f1.4G, but the newer, cheaper f1.8G model is almost as good and can match it sharpness. It’s still quite a large lens even if it’s a little lighter. As the equivalent to a 75mm, Sigma’s full-frame 50mm f1.4 EX HSM is the best performing model at this focal length but at $499 the old Nikon AF Nikkor 50mm f1.4D and its replacement the AF-S Nikkor 50mm f1.4G are both cheaper. But bear in mind, like all AF-D models, the D5200 lacks support for AF, that’s if it can still be found new on dealer’s shelves. There are no such concerns with the ultrasonic motor found on the AF-S models, but the focal length comes up a little ‘short’ on APS-C bodies for portraits. Intriguingly, as the equivalent to a 90mm, Nikon’s new full-frame AF-S Nikkor 58mm f1.4G model doubles up as an effective portrait lens on DX cameras. We haven’t seen one to test it, but it will be added to the database as soon as we can. As we’ve seen with the primes, a number of zoom models have also seen their sharpness levels increase with the D5200 over its predecessor. At the top of the rankings, the upgraded Sigma 50-150mm f/2.8 EX DC APO HSM is the best performing zoom model in our database, regardless of focal length. This is followed closely by the current full-frame AF-S Nikkor 70-200mm f/2.8G ED VR II and new Tamron SP 70-200mm f/2.8 Di VC USD with a DxOMark score of 21 points. Both these models are the equivalent to a 105-300mm on the D5200, so there’s a case to consider those over the DX-format only Sigma 50-150mm, but neither are cheap exactly. As a ‘standard’ zoom, the Sigma 17-50mm (26-77mm) f2.8 EX DC OS HSM stands out for its balance of price versus performance. It may not possess the pro-level build of the Nikon AF-S 17-55mm f2.8G IF-ED, but it’s stabilized, has an ultrasonic-type AF motor and is both sharper and cheaper. If you have a Nikon D5200 and a favorite lens, we would very much like to hear from you. Please leave a comment below, stating what lens it is and why you like it.